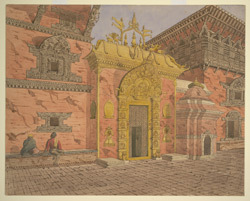 Watercolour of the Golden Gate in the Durbar at Bhaktapur in Nepal, by Henry Ambrose Oldfield (1822-1871), dated c.1854. This image is the original drawing for the illustration facing page 128 of Volume I of Oldfield's 'Sketches from Nipal, Historical and Descriptive...' (1880). Bhaktapur, the 'City of Devotees' is 11 km east of Kathmandu and 10 km north-east of Patan and is the youngest of the three former city-states of the Kathmandu Valley. Bhaktapur was founded in the 9th century and rose to prominence under the Malla dynasty. It remained a valley kingdom until the late 15th century when it became a sovereign state, together with Kathmandu and Patan. All three have similar architecture and were built around Durbar Squares containing Palace and Temple complexes. The Golden Gateway, seen in this view, is covered with gilt-copper carvings; it was erected by Ranjit Malla and dedicated to the goddess Taleju. Dr Oldfield, who was Residency Surgeon at Kathmandu from 1850-1863, wrote of the area in 'Sketches from Nipal, Historical and Descriptive...' (1880), "In each city the largest and most important building is the royal palace or darbar. It is situated in a central part of the city, and opposite to its principal front there is an open irregular square, which allows free access to the palace, and round which temples of various kinds are clustered together...In Kathmandu, Patan and Bhatgaon, most of the principal temples are in the immediate vicinity of the darbar; many are within its precincts, and many more are crowded around or opposite to its principal façade..."